I posted here a couple of days back that I was considering NOTA for both the Lok Sabha and the Assembly elections. A couple of my friends on Facebook commented that voting NOTA was a wasted vote. I do not agree that NOTA is a wasted vote. 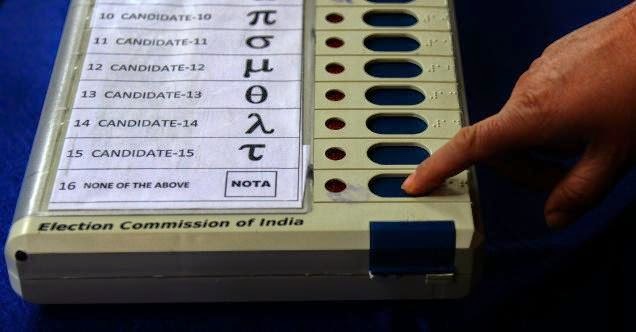 NOTA, for those who are not aware, is a new option that is being introduced by the Election Commission in this election that stands for "None of the above". It basically means that the voter does not think that any of the candidates standing for the election are acceptable to him or her and that a better candidate is needed. Note that the number of NOTA votes will not change the outcome of the election. So, for example, let's say that the number of people who vote for NOTA exceeds the number polled by any candidate. Even in that case, the candidate that polled the maximum number of votes would be declared elected. However, this is a good first step. At least this way, people will get to know how many people did not consider any of the candidates worthy of being elected. The next logical step would be to have a re-election in the constituency if the votes for NOTA exceed those polled by any of the candidates with the rider that none of the candidates who stood earlier would be allowed to contest! This gives a powerful weapon in the hands of the people to register their protest against candidates who are not fit to represent them in a legislative body. Coming to the concept of a wasted vote. I really don't believe there is anything like a wasted vote. I have seen many people argue that a vote for anyone other than the winning candidate or a candidate who has a fighting chance of winning is a wasted vote. This is quite ridiculous. Every vote makes a statement. If I vote against a particular candidate I am stating explicitly that I don't agree with this candidate's viewpoint on one or more issues. If I vote for a particular candidate, I am stating explicitly that I support that candidate's views on issues close to my heart. Then there is this whole debate about whether to vote for the candidate, the party he represents, local issues or specifically in this election, for the Prime Ministerial candidate. To each, his own is all I can say. I only said I was considering NOTA. I had not decided. I have still not decided. I didn't even know the various candidates that were contesting from my constituencies until Kartik helpfully posted a lot of information in an earlier post on this blog. I am going to go through the links he has posted there in the next few days before I make up my mind. But no, if I go NOTA, it is not going to be a wasted vote. "Choiceless by choice? A NOTA vote is a cop-out"
I totally understand that NOTA has a meaning. My only contention was that there definitely are options for you in your constituency, and to even mention NOTA (baded on Prime Ministerial candidates/central leadership) without knowing each of the individual candidates would be unfair.